This past semester, art students in Brett Colley’s class on printmaking, invited me to come talk about the Grand Rapids People’s History Project. The intent of the class was to have students investigate their own part of a People’s History of Grand Rapids and then make a print based upon an individual, social movement or a particular moment in history. What we will be sharing from here on out over the next several weeks, are the result of what these students created, based on their own investigation or based on previous posting from the Grand Rapids People’s History Project. We are excited to have these newly created visuals to compliment the rich history of social movements from the resistance to white settler colonialism all the way up to the present. This print was created by Brianne Freundt. 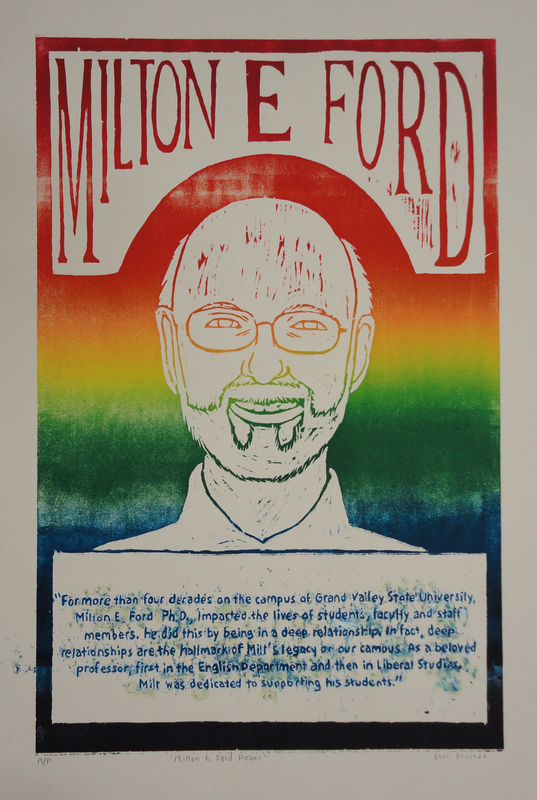 The print was inspired by the life and work of the founder of the GVSU LGBT Resource Center, now named the Milton E. Ford LGTB Resource Center. Here is an excerpt from an interview with Milt Ford, taken from the Grand Rapids LGBTQ People’s History Project. You can also watch the full interview with Milt Ford at this link and watch the film on the Grand Rapids LGBTQ movement. This entry was posted in LGBTQ Movement, People's History Artwork and tagged Grand Rapids LGBTQ movement, GVSU LGBT Resource Center, Milt Ford, People's History of the LGBTQ Community in Grand Rapids. Bookmark the permalink.